Home / Uncategorized / Why Can’t My Body Do That? In my late teens, I hit a plateau. It seemed no matter how hard I worked on certain poses, they simply weren’t accessible to me. I felt like a failure. I’d been told over and over if you practice a pose every day for a year, you’d be able to accomplish it. Yet somehow, there were certain poses I simply couldn’t do. Why did no one tell me that the design of my body could be causing the limitation? or that if I did push hard to accomplish a pose it could put my body and joints in serious jeopardy? Finally, why did my first YTT not educate me about proportions, compression vs. tension and orientation? Let’s start with the lack of education regarding natural limitations in the body. 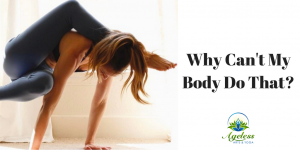 I suspect it’s because for so many yoga teachers they have what I like to call “traditional yogini bodies.” Long, slender and in many cases hyperflexible. My experience is two-fold… you don’t know what you don’t know, and when something comes to you with great ease, it is hard to understand the challenges others face. I personally was blown away the first time I watched “Anatomy for Yoga with Paul Grilley.” Despite the fact that I knew I had short arms, I had no understanding of how drastically they affected my practice. I had no clue that my ankle joints created such huge limitations. In regards to you don’t know what you don’t know, I was shocked to learn that not everyone could touch their chin to their sternum, or raise their arms up and behind their head. 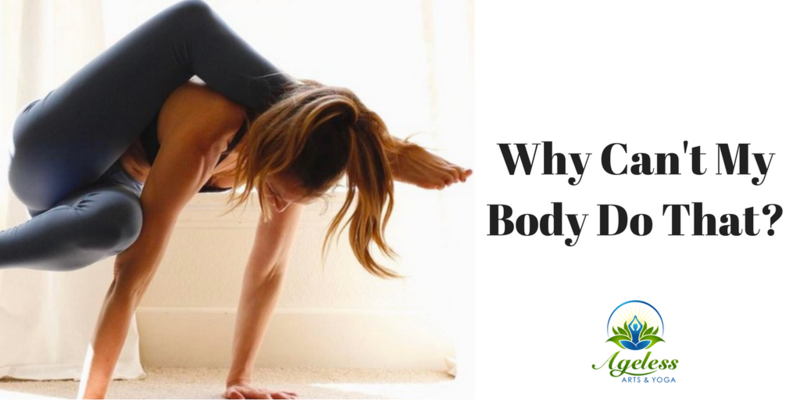 For years, I questioned why so many students didn’t drop their chest through in downward dog or struggled in shoulder stand and plough. What hit me the most was that as a teacher I was potentially putting my students is the risk of injury. Which leads us to the problem of idolizing the hyper-flexible and the lack of educations about “overstretching.” Have you noticed in the last 5-10 years how many of our teachers are suddenly having hip and knee issues? I can think of a few teachers who’ve actually required knee and/or hip replacements. They are now struggling with the thought of practising yoga because they feel that they were let down by the practice. That “yoga” was the cause of their injuries. I don’t believe that yoga was the cause, but rather an extreme version of yoga. How can we study ahimsa (the principle of non-violence to all living things), and then in the next breath ask someone to push through pain and discomfort of a pose to accomplish something that is generally unnatural for most bodies? Our joints are meant to be stable to protect us from injury. Yes, we can stretch and stretch and eventually the muscles, tendons and ligaments will stretch to the point that the joint will become loose and sloppy. When the joint is this loose, you will likely be able to accomplish some extraordinary poses. The question is, are you willing to give up comfort in walking in your senior years for the chance to say that you could once put your foot behind your head? Now onto the lack of educations in Yoga Teacher Trainings (YTT’s.) Yoga is a lineage-based system. Teachers teach what they were taught. If proportions, compression vs. tension and orientation were not taught in their training, chances are it won’t be offered in the training they offer. Here is my request. Be sure to practice the Niyama – Svadhyaya (self-study.) Chances are if you’ve read this article, it is already a part of your practice. Continue to take workshops. Educate yourself about how proportions affect a students practice. Explore the sensations of compression and tension in your body, and ask your students to do the same. Finally, play with a set a poses that essentially are the same and see how they change based on orientation. Don’t just learn/teach anatomy, learn and show how it affects our practice of yoga. Would you like to learn more? Join me July 6th, 2018 10am-4pm for a workshop exploring all of the above.